To Cite: Annie Abraham R, Sundareswaran S. Comparison of Ricketts, Pancherz and Centrographic Superimposition Methods in Post-Treatment Assessment of the Effects of Twin Block-Appliance Therapy, Iran J Ortho. 2018 ; 13(2):e12512. doi: 10.5812/ijo.12512. Objectives: Aim of this study was to do a comparative post-treatment assessment, using three superimposition methods (Ricketts, Pancherz and Centrographic), in patients with Angle’s Class II Division 1 malocclusion and functional retrusion of mandible following twin block appliance therapy. Methods: In this retrospective cross sectional study, pre and post-treatment lateral cephalometric radiographs of 33 cases were analyzed and compared using Ricketts, Pancherz and Centrographic superimposition methods. Changes were evaluated quantitatively for all three methods using a reference grid. The anteroposterior position of upper and lower centroids with respect to the centroid plane was evaluated. Results: Paired samples t-tests and intraclass correlation coefficient revealed excellent reliability of Ricketts, Pancherz and Centrographic superimposition techniques for all parameters. An advancement of 4.14 + 2.24 and 4.18 + 2.26 in Pancherz, 4.30 + 2.14 and 4.38 + 2.18 in Ricketts and 4.36 + 2.19 and 4.50 + 2.19 in Centrographic superimposition methods was shown by point B and pogonion respectively. The observed advancement of Point B and restriction of mesial movement of upper first molar (U6) was statistically significant for Centrographic method as compared to Pancherz. Advancement of lower centroid was seen in all cases with 72.7% in level with centroid plane and 24.2% within 1mm of it. Conclusions: All three superimposition methods (Ricketts, Pancherz and Centrographic) proved equally reliable in assessing treatment changes following twin block therapy. Forward movement of lower centroid was observed in 100% of the cases indicating true mandibular advancement following twin block appliance therapy in Skeletal Class II Division 1 malocclusions. Cephalometrics is an established diagnostic and research tool in orthodontic practice. To study growing children over time, Broadbent identified various landmarks that were geometrically related and superimposed them on successive lateral cephalograms (1). This sequential analysis was the first longitudinal assessment of craniofacial growth. Later, many cephalometric analyses were developed, each having various limitations (2-5). Both, treatment changes of the facial structures as well as an overall assessment of growth is provided by superimpositions of the cranial base (6, 7). However, errors develop due to growth and remodelling of the reference plane, as well as to the reproducibility of superimposition on the plane itself (8). Conventional cephalometrics uses linear and angular measurements to evaluate growth and facial form. These findings are compared with norms obtained from preselected normal subjects. Each individual expresses his/her own unique pattern of craniofacial development. As morphologic homogeneity within these preselected ‘normal’samples may not exist, the concept of numerically comparing such norms and its application for evaluating individuals who do not demonstrate anatomic homogeneity may be subjected to inaccuracy (9). Therefore a need has always been felt for nonnumeric facial analyses that would not compare an individual’s facial measurements with pre established norms, and would rather evaluate the facial form individually which would help in diagnosis and treatment planning unique to that individual. Such an analysis was developed by Johnson and Hubbold (10) and later modified by Fishman (9). Referred to as the Centrographic analysis, it has received little attention in the literature after its introduction. In Centrographic analysis, the centroids are located within four anatomically determined triangular areas. It is a visual analysis with no angles and no normative data for comparison. After a reference plane is developed, the relative position of variable landmarks can be assessed. This plane can also be used for longitudinal cephalometric superimposition (11). A centroid can be defined as the center of mass or gravity of a two dimensional area or a three dimensional volume. It is stated to be a precise point and represents the mean myriad of small variations (9). This analysis is unique to each patient; supplying independent identification of anteroposterior landmarks, vertical facial proportion inequalities and a stable reference plane for longitudinal superimpositions (11). The principal difference between cephalometric landmarks and centroid is that the centroid changes only minimally in position as a triangle increases in size and shape, whereas cephalometric points located on the periphery of an enlarged area alter their positions much more (9). Class II Division 1 malocclusion with mandibular retrusion is one of the most frequent problems encountered in orthodontic practice. The twin block is an effective appliance in correcting this malocclusion. Favourable alterations in various clinical and cephalometric parameters have been reported following the use of this appliance (12-15). However, controversies exist regarding skeletal effects induced by functional appliances with some authors demonstrating significant influences on mandibular growth (16, 17) and others claiming only small skeletal changes (13, 18, 19). Evaluation of post-treatment changes following correction of skeletal class II malocclusion are usually done using Ricketts four position analysis (20), the Pancherz analysis (16) or conventional cephalometric line/angle measurements. Ricketts four position analysis evaluates maxillary and mandibular skeletal as well as dental changes. Pancherz’s method uses a reference grid to quantitatively evaluate sagittal skeletal and dental changes. 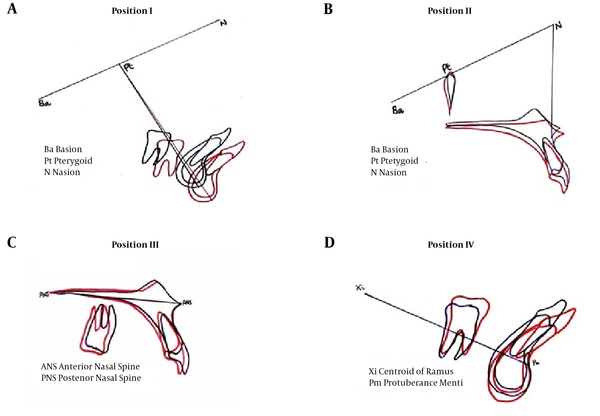 Peripherally positioned cephalometric points, prone to remodelling changes, (point A and B, nasion, pogonion, protruberance menti) are utilised in all the above cases. According to Centrographic analysis, upper and lower centroids lie above and below on the same plane in line with facial centroid in skeletal class I cases whereas the lower centroid is posteriorly positioned in class II (9). If change in position of the lower centroid accompanies the above favourable cephalometric alterations, this would depict a true skeletal change, more reliably representing the uniqueness of a person according to Fishman (9). This needs to be verified in post-treatment evaluations after correction using twin block appliance. 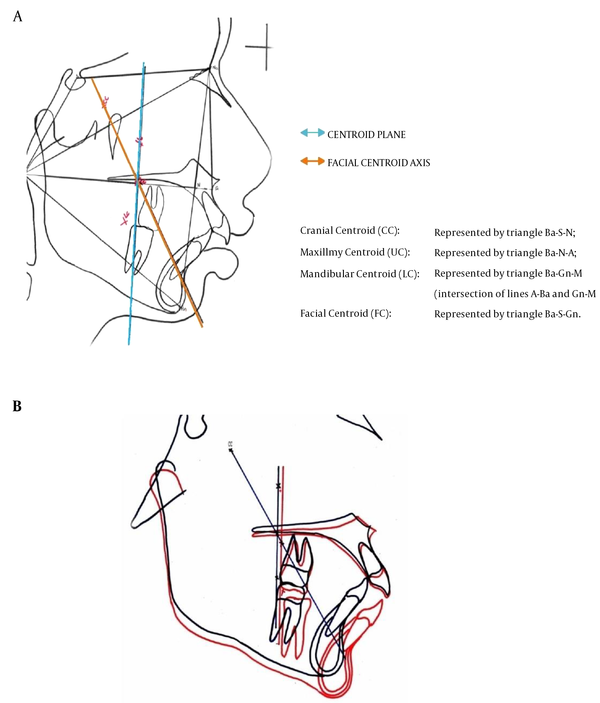 This study hopes to shed more light on the effectiveness of Centrographic analysis in assessment of skeletal changes in patients with Angle’s Class II Division 1 malocclusion with functional retrusion of mandible after twin block therapy. Our aim was to do a post-treatment comparison, using all three superimposition methods and also assess relative change in position of the lower centroid. A null hypothesis was generated assuming that there may be no difference in evaluation of post-treatment results using Ricketts four position analysis (20), the Pancherz’s analysis (16) or the Centrographic analysis in patients with Skeletal Class II Division 1 malocclusion due to mandibular retrusion after twin block appliance therapy. Pre and post-treatment lateral cehalograms were obtained from orthodontic departmental records of 33 patients with Angle’s Class II Division 1 malocclusion due to functional retrusion of mandible, treated with twin block appliance. Approval was obtained from the Institutional Research Board and Institutional Ethics Committee for this retrospective, cross sectional study. All cephalograms had been taken by the trained radiographic technician of the institute under standard conditions. The head was positioned in cephalostat with Frankfurt horizontal plane parallel to the floor, teeth in maximum intercuspation and relaxed lips. The Planmeca 2002 CC Proline Cephalostat was used. A pilot study was done in 10 cephalograms. Sample size was determined using a power calculation based on point B as key variable. To detect a change of 0.25 mm in pre and post-treatment values with 95% confidence and 80% power, we required a minimum sample size of 32. Pre and post-treatment lateral cephalograms of only those patients who met the following inclusion criteria were selected: (1) Skeletal class II malocclusion with retrognathic mandible (13), (2) full cusp class II molar relation on both sides, (3) an angle ANB of 5° or greater at the start of treatment (13), (4) 10 to 14 years of age (14) and (5) normodivergent/normal growth pattern-MOCC between - 4 and + 4: Go-Gn to SN line -28 - 36° (21). Radiographs of poor quality were excluded. The same investigator hand traced all cephalograms onto 0.003 inch matte acetate paper with a sharpened 2H lead drafting pencil, under optimal illumination. All measurements were taken with the same standard company instruments and rounded off to nearest 0.5 mm. Landmarks used in the study are given in Figure 1. 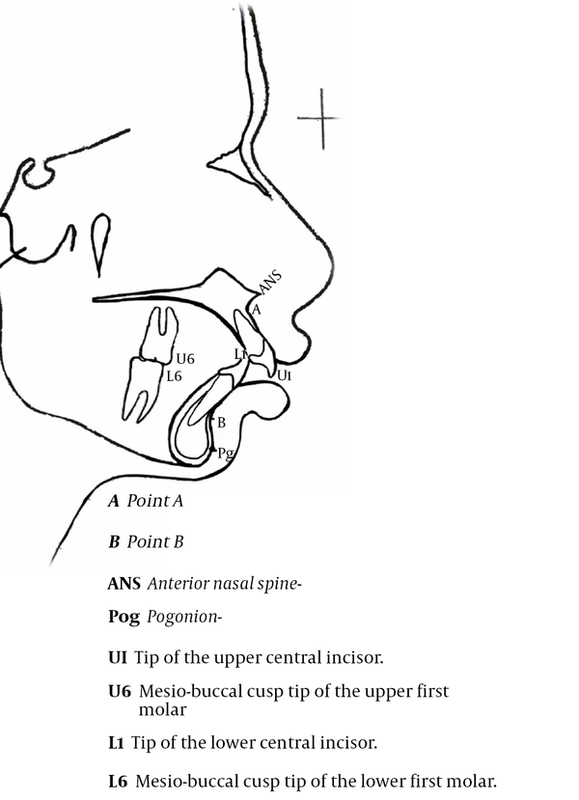 Changes in ANS and point A would indicate the maxillary skeletal changes and changes in Point B and Pogonion would indicate mandibular changes. U1, U6 L1 and L6 would indicate maxillary and mandibular dental changes respectively. Superimposition techniques advocated by Ricketts, Pancherz and Centrographic analysis were used to evaluate differences or similarities when interpreting skeletal and dental changes within the same person while comparing the pre and post-treatment changes on lateral cephalograms. Each pair was traced and superimposed three times, and averaged. There are four steps in Ricketts’ method to evaluate orthodontic treatment (20). Mandibular and maxillary skeletal changes are shown in positions I and II, whereas positions III and IV are used to show maxillary and mandibular dental changes (Figure 2). In the Pancherz’s method, sagittal skeletal and dental changes are evaluated quantitatively. 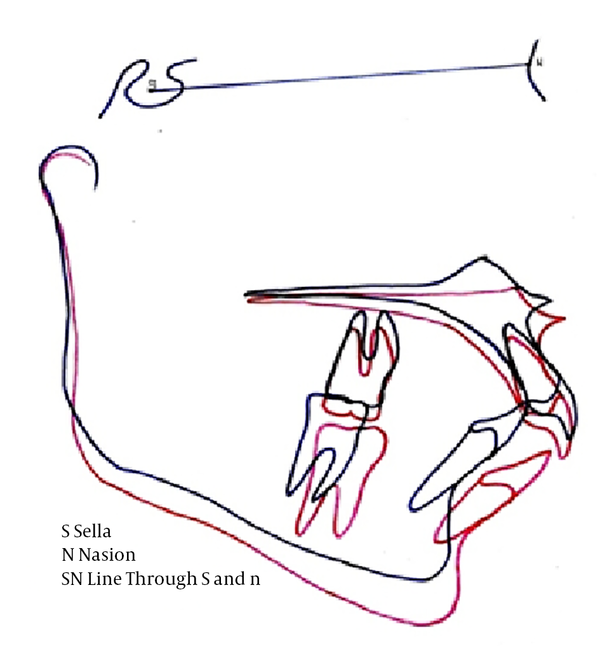 This is done with a reference grid is established by the occlusal plane (OL) and its perpendicular plane (OLp) through sella point on the initial cephalogram. After superimposing cephalograms on SN at S, skeletal changes in maxilla and mandibula are measured from the movement of the representative landmarks along the initial OL plane to OLp. 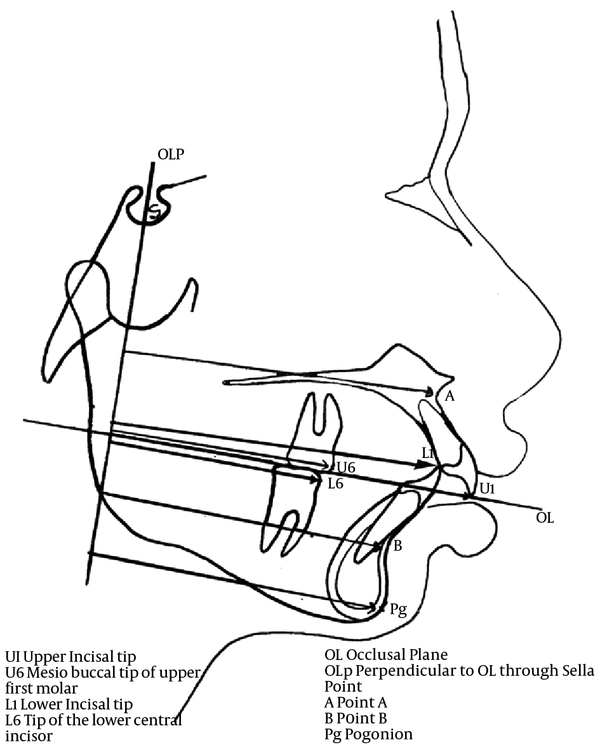 Similarly, dental changes are obtained from the movement of the dental landmarks along OL plane to OLp (16). These changes are subtracted from the movement of their related skeletal basis (Figure 3). Centrographic analysis can be used to evaluate the facial form graphically without the need for potentially invalid numerical standards of reference (9). The centroids are located within four triangular areas which are anatomically determined. They are (i) cranial centroid (CC) in triangle Ba-S-Na, (ii) upper centroid (UC) in triangle Ba-Na-A, (iii) lower centroid (LC) in triangle Ba-Gn-M (intersection of lines A-Pt- Ba and Gn- N ) and facial centroid (FC) in triangle Ba-Na-Gn (Figure 4). The centroid plane is constructed as a perpendicular to Ba-N through the facial centroid (FC). facial centroid axis (FCA) is an extended mid sagittal plane, that is oriented anatomically (CC to FC). It maintains a relatively stable position throughout the growth period. Superimposition is made on FCA at CC. Even though it is a non-numerical analysis all the findings were converted to numerical values for ease of comparison with the other two methods. In sagittal plane, the anteroposterior position of the Uc, Lc points with respect to the centroid plane is studied for evaluating sagittal relation (Figure 4). A reference grid was used to evaluate the changes quantitatively for all the three methods. The study had taken a reference coordinate system to evaluate the changes quantitatively as described in earlier studies (22). Figure 5 shows the pre-treatment radiograph with x-axis represented by the occlusal plane (OL) which is a line connecting the incisor tip of the most prominent maxillary central incisor and the disto-buccal cusp of the maxillary permanent first molar, and the y-axis represented by a line perpendicular to this plane (OLp) through point S.
All the landmarks, structures and the reference grid were marked on pre and. Post-treatment tracings for all the three methods. The post-treatment tracings were then superimposed on the pre-treatment tracings manually according to the three different methods and were subsequently transferred on to the grid. After measuring the selected landmarks along the OL plane to OLp within the coordinate system, the dental and skeletal changes were calculated and recorded according to the three different superimposition methods. To test intraexaminer reliability, 10 radiographs were selected and all procedures including racing, identification of landmarks, superimposition and measurements were repeated after two weeks by the same investigator. Testing was done using the ICC (intraclass correlation coefficient). All the statistical analyses were performed using SPSS statistical package (version 16) (SPSS Inc., Chicago III) for windows. Descriptive statistics, including means and standard deviations, of the cephalometric parameters were calculated for each superimposition technique. Paired samples t-tests was used to assess and quantify changes before and after treatment within each superimposition group. The level of significance was set at P < 0.05. The intraclass correlation coefficient (ICC) was used to test the reliability of 3 super imposition technique . Intraclass correlation >/ = 0.8 shows excellent reliability. No statistically significant differences were found between the measurements made at two different time points, two weeks apart, for the purpose of error testing as evidenced by ICC (Table 1). Table 2 shows the mean with standard deviations, minimum and maximum values of all the evaluated parameters of the three analysis. Intraclass correlation coefficient, used to test the reliability of three superimposition techniques showed excellent reliability of Ricketts, Pancherz and Centrographic superimposition techniques for all parameters (Table 3). Table 4 shows the comparison of various parameters among the three superimposition techniques. An advancement of 4.14 + 2.24 and 4.18+2.26 in Pancherz, 4.30 + 2.14 and 4.38 + 2.18 in Ricketts and 4.36 + 2.19 and 4.50 + 2.19 in Centrographic superimposition methods was shown by Point B and pogonion respectively. The difference in post-treatment value for point B as well as U6 was statistically significant for Centrographic method as compared to Pancherz. Table 5 shows the descriptive statistics (mean, std deviation, minimum, maximum) of upper, lower and facial centroids used in Centrographic analysis. An assessment of the comparative change in position of lower centroid with respect to the centroid plane revealed that all 33 cases showed advancement of lower centroid after twin block therapy. 24 cases (72.7%) showed lower centroid to be in level with the centroid plane. In 8 cases, (24.2%) lower centroid was just 1mm behind the plane and 1 case (3%) was > 1 mm behind (Table 6). Pertaining to the post-treatment effects, the results obtained here are in agreement with many previous studies which have reported significant mandibular growth with twin block appliance (13-15, 23, 24). Restriction in forward growth of maxilla by twin block appliance has been reported earlier (13, 15, 23, 25, 26). However, some authors have not supported this (12, 27). Ideal conditions for the correction of a class II molar relationship would be distal movement of the maxillary molars (U6) and mesial movement of the mandibular molars (L6). In the present study, the distal movement of U6 and greater forward position of L6 in the treated subjects was a major factor contributing to the class II molar correction. More mesial eruption of the mandibular molars following twin block therapy has been reported by Mills and McCulloch (13). Lund and Sandler (14) noted substantial (2.4 mm) forward movement of L6 compared with the controls (0.1 mm), whereas Toth and McNamara (15) found equal forward movement of L6 in both twin block and control groups. Lower centroid has been reported to be posteriorly positioned in skeletal class II according to Centrographic analysis (9). If change in position of the lower centroid accompanies the above favourable cephalometric alterations, this would depict a true skeletal change, more reliably representing the uniqueness of a person according to Fishman (9). On verification, in the present study, all 33 cases showed advancement of lower centroid after twin block therapy. 24 cases (72.7%) showed lower centroid level with centroid plane. 8 cases (24.2%) showed lower centroid 1mm behind the centroid plane. One case (3%) showed lower centroid > 1 mm behind the centroid plane. Due to lesser variance of centroid points, Centrographic analysis is unique in providing a more stable reference system making cephalometric analysis more accurate. Facial centroid axis maintains a relatively stable spacial position throughout the growth period. According to Fishman the reason for stability of FCA directly relates to the basic centroid principle that position of centroid moves very little as compared to points on the periphery of the area represented. Because of relative stability of FCA, it is possible to locate exact anatomic sites where treatment changes occurred (28). Present study also agrees to the fact that centroid points are less variable than anatomic points and forward positioning of lower centroid after twin block therapy showed true skeletal change. A limitation of all three superimposition methods is that any change in the transverse dimension cannot be assessed. 1. All the three superimposition methods (Ricketts. Pancherz and Centrographic) are equally reliable in assessing treatment changes following twin block therapy. Hence null hypothesis is accepted. 3. Forward movement of lower centroid was observed in 100%of the cases, of which 72.7%was in line with centroid plane and 24.2% within 1mm behind the centroid plane. This apparently shows true skeletal change after twin block therapy. Authors' Contribution: Shobha Sundareswaran is responsible for developing the original study concept and design, the protocol, analyzing and interpretation of data, critical revision for important intellectual content, overall supervision and is the guarantor. Rency Annie Abraham contributed to the development of the protocol, acquired, abstracted and analyzed data, did the statistical analyses and wrote the manuscript. All the authors approved the final version of the manuscript. Ethical Considerations: Ethical approval was obtained from the Institutional Research Board and Institutional Ethics Committee for this retrospective, cross sectional study. Funding/Support: No funding or financial support was received for this study. 1. Broadbent BH. A new x-ray technique and its application to orthodontia. Angle Orthod. 1931;1(2):45-66. 2. Downs WB. Analysis of the dentofacial profile. Angle Orthod. 1956;26(4):191-212. 3. McNamara JA Jr. A method of cephalometric evaluation. Am J Orthod. 1984;86(6):449-69. [PubMed: 6594933]. 4. Steiner CC. Cephalometrics for you and me. Am J Orthod. 1953;39(10):729-55. doi: 10.1016/0002-9416(53)90082-7. 5. Moorrees CFA. Normal variation and its bearing on the use of cephalometric radiographs in orthodontic diagnosis. Am J Orthod. 1953;39(12):942-50. doi: 10.1016/0002-9416(53)90153-5. 6. Bergersen EO. A comparative study of cephalometric superimposition. Angle Orthod. 1961;31(4):216-29. 7. Ghafari J, Engel FE, Laster LL. Cephalometric superimposition on the cranial base: A review and a comparison of four methods. Am J Orthod Dentofacial Orthop. 1987;91(5):403-13. doi: 10.1016/0889-5406(87)90393-3. [PubMed: 3472459]. 8. Goel S, Bansal M, Kalra A. A preliminary assessment of cephalometric orthodontic superimposition. Eur J Orthod. 2004;26(2):217-22. doi: 10.1093/ejo/26.2.217. [PubMed: 15130046]. 9. Fishman LS. Individualized evaluation of facial form. Am J Orthod Dentofacial Orthop. 1997;111(5):510-7. doi: 10.1016/S0889-5406(97)70288-9. [PubMed: 9155810]. 10. Johnson JS, Hubbold RJ. An introduction to centroid cephalometrics. Br J Orthod. 1982;9(1):32-6. [PubMed: 6948572]. 11. Dolce C, Schader RE, McGorray SP, Wheeler TT. Centrographic analysis of 1-phase versus 2-phase treatment for Class II malocclusion. Am J Orthod Dentofacial Orthop. 2005;128(2):195-200. doi: 10.1016/j.ajodo.2004.04.028. [PubMed: 16102404]. 12. Illing HM, Morris DO, Lee RT. A prospective evaluation of bass, bionator and twin block appliances. Part I - the hard tissues. Eur J Orthod. 1998;20(5):501-16. doi: 10.1093/ejo/20.5.501. [PubMed: 9825553]. 13. Mills CM, McCulloch KJ. Treatment effects of the twin block appliance: A cephalometric study. Am J Orthod Dentofacial Orthop. 1998;114(1):15-24. doi: 10.1016/S0889-5406(98)70232-X. [PubMed: 9674675]. 14. Lund DI, Sandler PJ. The effects of twin blocks: A prospective controlled study. Am J Orthod Dentofacial Orthop. 1998;113(1):104-10. doi: 10.1016/S0889-5406(98)70282-3. [PubMed: 9457025]. 15. Toth LR, McNamara JJ. Treatment effects produced by the twin-block appliance and the FR-2 appliance of Frankel compared with an untreated Class II sample. Am J Orthod Dentofacial Orthop. 1999;116(6):597-609. [PubMed: 10587592]. 16. Pancherz H. The mechanism of Class II correction in Herbst appliance treatment: A cephalometric investigation. Am J Orthod. 1982;82(2):104-13. doi: 10.1016/0002-9416(82)90489-4. [PubMed: 6961781]. 17. Pancherz H. A cephalometric analysis of skeletal and dental changes contributing to Class II correction in activator treatment. Am J Orthod. 1984;85(2):125-34. [PubMed: 6594053]. 18. Windmiller EC. The acrylic-splint Herbst appliance: A cephalometric evaluation. Am J Orthod Dentofacial Orthop. 1993;104(1):73-84. doi: 10.1016/0889-5406(93)70030-R. [PubMed: 8322726]. 19. DeVincenzo JP. Changes in mandibular length before, during, and after successful orthopedic correction of Class II malocclusions, using a functional appliance. Am J Orthod Dentofacial Orthop. 1991;99(3):241-57. doi: 10.1016/0889-5406(91)70006-I. [PubMed: 1998300]. 20. Ricketts RM. A four-step method to distinguish orthodontic changes from natural growth. J Clin Orthod. 1975;9(4):208-15. 218-28. [PubMed: 1056343]. 21. Sundareswaran S, Kumar V. Reliability of Beta angle in assessing true anteroposterior apical base discrepancy in different growth patterns. J Nat Sci Biol Med. 2015;6(1):125-30. doi: 10.4103/0976-9668.149109. [PubMed: 25810649]. [PubMed Central: PMC4367023]. 22. You QL, Hagg U. A comparison of three superimposition methods. Eur J Orthod. 1999;21(6):717-25. [PubMed: 10665202]. 23. Jena AK, Duggal R, Parkash H. Skeletal and dentoalveolar effects of twin-block and bionator appliances in the treatment of Class II malocclusion: A comparative study. Am J Orthod Dentofacial Orthop. 2006;130(5):594-602. doi: 10.1016/j.ajodo.2005.02.025. [PubMed: 17110256]. 24. Gill DS, Lee RT. Prospective clinical trial comparing the effects of conventional twin-block and mini-block appliances: Part 1. Hard tissue changes. Am J Orthod Dentofacial Orthop. 2005;127(4):465-72. quiz 517. doi: 10.1016/j.ajodo.2004.11.012. [PubMed: 15821691]. 25. O’Brien K, Wright J, Conboy F, Sanjie YW, Mandall N, Chadwick S, et al. Effectiveness of early orthodontic treatment with the twin-block appliance: A multicenter, randomized, controlled trial. Part 1: Dental and skeletal effects. Am J Orthod Dentofacial Orthop. 2003;124(3):234-43. doi: 10.1016/S0889-5406(03)00352-4. [PubMed: 12970656]. 26. Trenouth MJ. Proportional changes in cephalometric distances during twin block appliance therapy. Eur J Orthod. 2002;24(5):485-91. [PubMed: 12407944]. 27. Jena AK, Duggal R. Treatment effects of twin-block and mandibular protraction appliance-IV in the correction of class II malocclusion. Angle Orthod. 2010;80(3):485-91. doi: 10.2319/062709-359.1. [PubMed: 20050741]. 28. Trenouth MJ. Centroid analysis of twin-block appliance treatment for Class II Division 1 malocclusion. World J Orthod. 2006;7(2):159-64. [PubMed: 16779975].